Geneva (AFP) - The UN's envoy for Syria said he held "substantive" talks with the country's opposition Thursday on forging a unity government, but the fragile peace negotiations faced fresh hurdles after Syria's Kurds declared a federal region under their control. United Nations mediator Staffan de Mistura said his talks in Geneva with the main opposition High Negotiations Committee (HNC) included clear proposals on a political transition to lead Syria out of more than five-years of brutal conflict. "We were impressed by the depth of the preparation they had," de Mistura told reporters following his HNC meet. A key question in the talks will be how representatives of the Damascus government respond, including to the HNC's unwavering demand that President Bashar al-Assad leave power before a transitional government is agreed. Thursday's Kurdish declaration -- aimed at setting up a "federal system" unifying territory run by Kurds across several Syrian provinces -- risked further complicating the negotiations, from which the Kurds have been excluded. 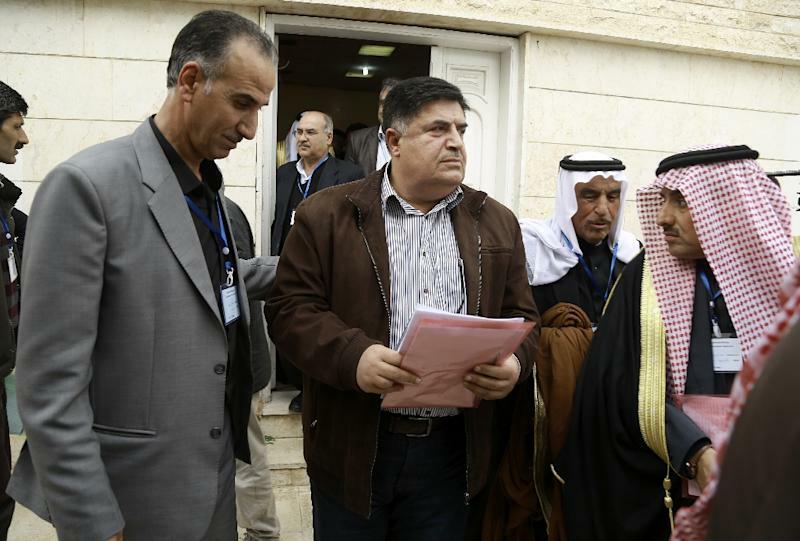 The federalism call made by more than 150 delegates meeting in the Syrian town of Rmeilan was immediately rejected by Damascus and the main opposition. 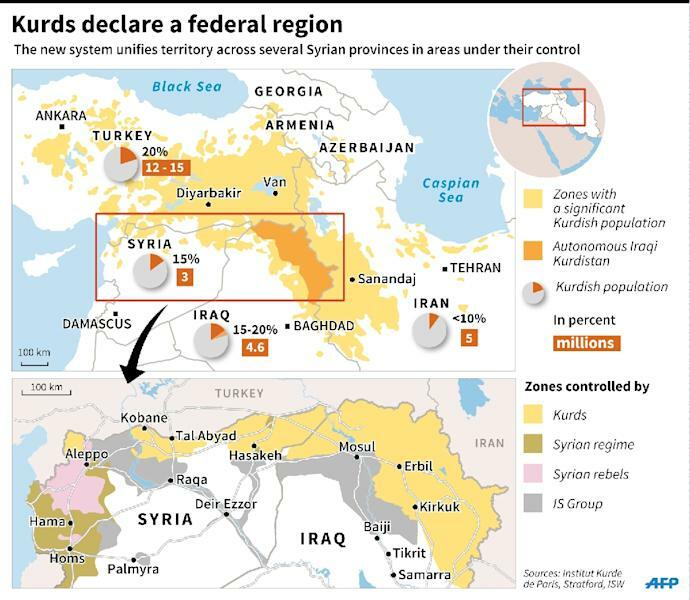 The regime charged the move would "encroach on Syria's territorial unity", while the HNC slammed it as "a misadventure (that) is detrimental to the Kurdish cause and the Syrian cause in general." Speaking before Kurdish leaders made the announcement, de Mistura branded the federalism push as possibly "dangerous". 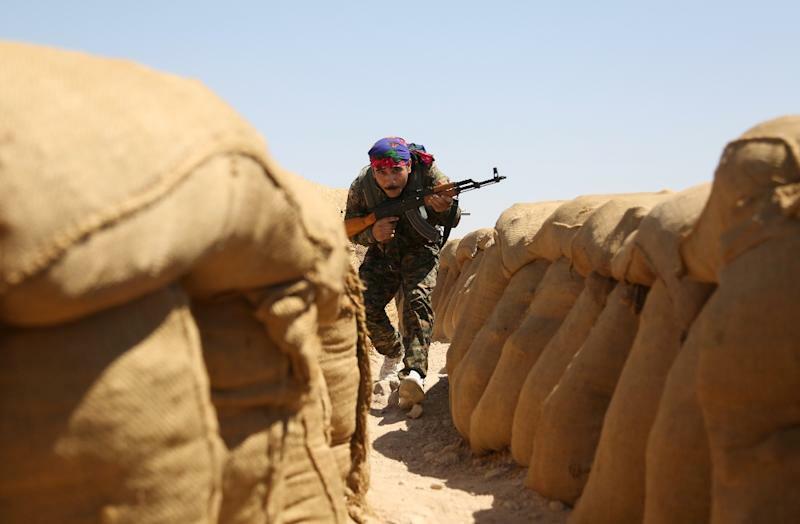 The Kurds control more than 10 percent of Syria's territory and three-quarters of its border with Turkey, and the Kurdish People's Protection Units (YPG) are considered one of the most effective forces fighting the Islamic State group (IS). The US declared Thursday that IS's slaughter of Christians, Yazidis and Shiites in Iraq and Syria amounts to a genocide and vowed to halt it. The Kurds have been blocked from joining the peace talks due to harsh opposition from Turkey, which considers the YPG a Syrian affiliate of the Kurdistan Workers' Party (PKK), an outlawed group that has waged a decades-long insurgency against Ankara. The latest round of UN-mediated talks aimed at ending Syria's tangled war, which has killed more than 270,000 people, have been taking place since Monday. Observers agree the atmosphere this time around has been more constructive than during multiple previous failed peace efforts, largely thanks to a partial ceasefire introduced on February 27 that remains broadly in place. HNC delegate Georges Sabra said his side had presented a "formal proposal" outlining the specific powers of a transitional government. Asked if she felt the regime was a willing negotiating partner, HNC spokesman Bassma Kodmani told reporters "this is for the UN," to decide. "The partner on our side is there. The international community recognises (that)," she said. A US official agreed, telling AFP in an email that the HNC "are taking this seriously." De Mistura is due to meet Assad's representatives again on Friday. Russia's surprise decision this week to withdraw most of its forces from Syria, where they had been fighting in support of Assad, fuelled cautious hope that the talks could make progress. Western governments suggested that the pullout, expected to be completed by the end of the week, could pressure Assad to negotiate an end to the fighting. But Russian President Vladimir Putin said his country could ramp up its presence again if needed "within several hours". Moscow is set to maintain its air base and a naval facility in Syria and Putin indicated that Russia's drawdown would not significantly change the balance of forces in Syria. "In terms of finding a political solution, the question is to what degree are the Russians prepared to move the regime towards something that would be minimally acceptable to the opposition," the US official said. Meanwhile, with the ceasefire broadly holding, a UN-backed taskforce working to deliver aid to besieged Syrians submitted a plan to the regime that would allow life-saving supplies to reach over a million people by the end of April. Crucial to the plan's success was whether Damascus would grant humanitarian workers access to all areas besieged by government troops, taskforce chief Jan Egeland said.